The Apple VGA Adapter for iBook, PowerBook G4 12", iMac G4 or eMac allows users to mirror their display to an external VGA monitor/device. The VGA adapter cable plugs into the Mini VGA Video Output port built into the computer or laptop. The Apple Video Adapter for iBook requires an iBook G3 or G4, 12-inch PowerBook G4, iMac G4 or eMac with a mini-VGA port. NB. This item does not work with an Apple mini DVI port or with iBook A/V port. 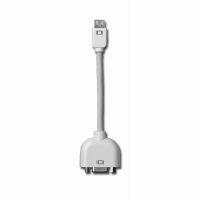 This Apple VGA adapter for an iBook or PowerBook G4 is in stock and ready to ship.